I am sure most of you know about The WoW Club. Women on Wanderlust is a group with a sole motto of traveling and yes it is a women only group. We all understand well that when it comes to travel alone for a woman, there are a lot of constraints that come into the way. Safety while travel, getting time out from the daily grind of handling home and work and of course the stress of booking hotels and tickets are the main deterrents in that order. I know many single women who crave to travel but keep waiting till they find a suitable travel companion. A group like The WoW Club solves all of these problems and even encourages those who have a family but can manage to travel alone to get some breather away from the family responsibilities. I met many of these women at this event who have taken to travel like fish to water and are happy like a bird. Travel makes one feel the freedom like nothing else. Out of the comfort zone and yet very very comfortable with the unknown, unseen. So when these women on wanderlust come together for an even organised by Microsoft Devices for Lumia app tasting along with wine tasting and sampling good food, you expect an eclectic mix of women from all age groups, from all over the country having a blast. 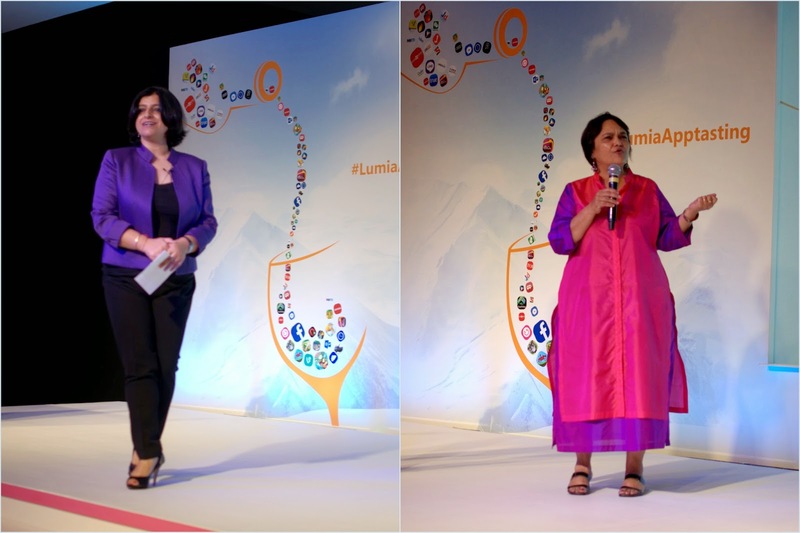 Poonam Kaul (Director Communications, Nokia) and Shabri Kashyap spoke about traveling and how cell phone apps can be helpful for travelers. What if the event is hosted by two boisterous punjabis adding loads of fun to the evening. Playing games with the attendees, singing songs and doling out prizes. Many apps were introduced to the travelers present there. Some apps are really useful for a traveler like finding places worth seeing in the vicinity, finding restaurants and even clicking good pictures or selfies. 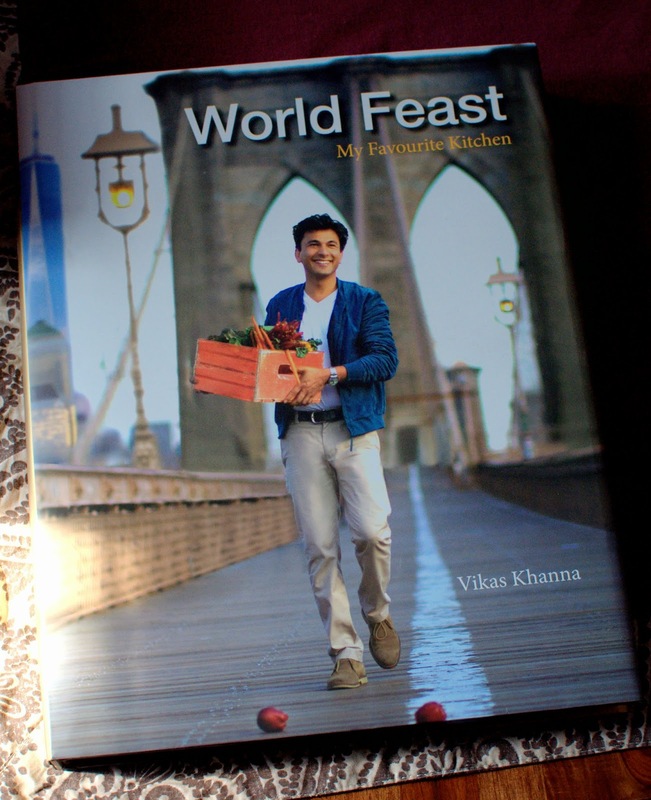 Chef Vikas Khanna released his new book World Feast at the event and wooed the audience by his charming smile as always. 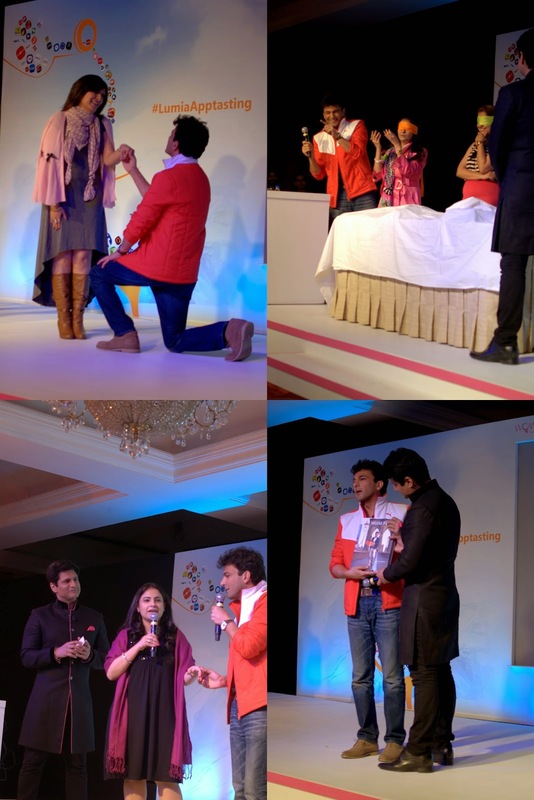 Rajiv Makhni (technology writer and TV host) was a live wire with antics too. This is a hefty book with beautiful pictures and recipes that you would want to try immediately. Looks like a coffee table book but a real useful cookbook for those who want to have a taste of the world. The book has recipes from all over the world that can be easily created in an Indian kitchen, very practical recipes I must add. The first thing I wanted to cook from this book was an eggplant rollatini that is inspired by Gordon Ramsay's eggplant rollatini stuffed with mozzarella. This one is stuffed with ricotta and I loved this idea so much that I actually made fresh ricotta and yet finished cooking it within 30 minutes. 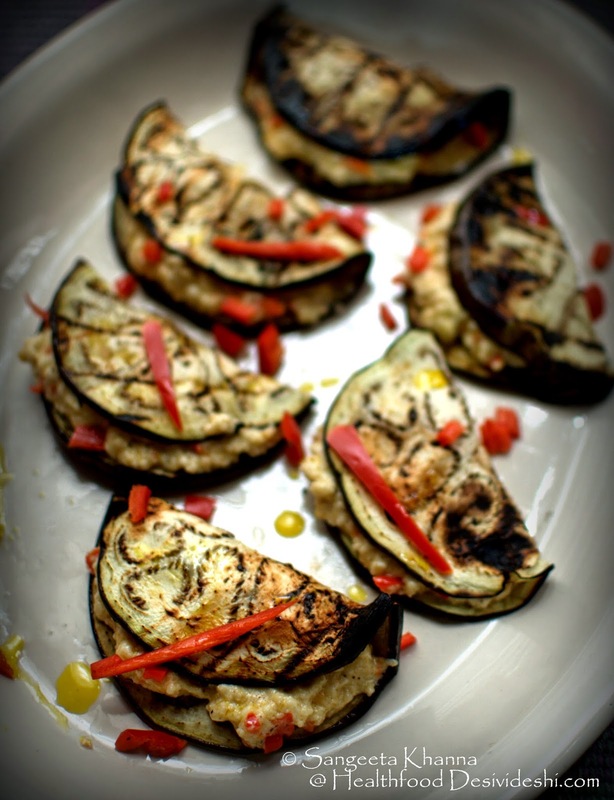 Yummy melting ricotta infused with red chilly peppers wrapped in melt in the mouth smoky slices of eggplant. This is a recipe that defines the combination of simplicity and good taste. Since we are getting very good round variety of eggplants in this season, I used those and made wraps instead of rolls but that doesn't change the way it tastes. Rather you can stuff more ricotta in each of those rollatini. Absolutely cheesy yummy. I replaced the type of chilly peppers used depending on the season again. The fresh red chilly peppers are so irresistible these days and they worked so nicely for this recipe too. Mince the red chilly peppers and keep aside. Slice the eggplant thinly and grill over gas flame placing them over a metal grid. You can brush them with oil before grilling or just grill them directly, I like them both ways as once cooked and lightly charred, the eggplant is heavenly any which way. You can also grill the eggplant slices in the oven but I love doing it over the flame. Flame grilling is much more enjoyable. Grill the slices on both sides till lightly charred and done. I made fresh ricotta** while the egg plant was sliced and grilled on gas flame. The recipe of fresh ricotta is given below. Place a pan on gas stove and pour the oil. Without waiting for the oil to heat up, tip in the minced red chilly peppers and let it sizzle for a second. Now tip in the fresh warm ricotta along with salt and pepper to taste and scramble the whole mixture to make a creamy consistency. 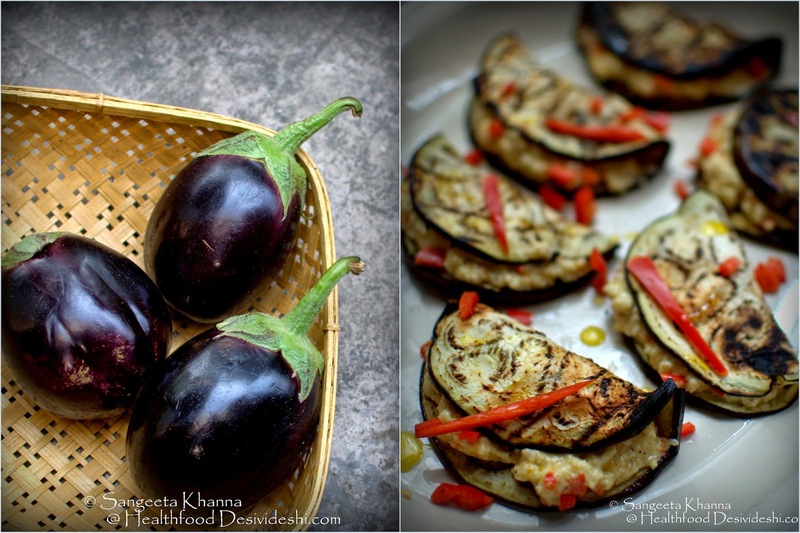 By now the eggplant slices will be grilled and cooked thoroughly. Place them one by one on a work surface (or chopping board), spread a generous spoonful of the warm ricotta stuffing and fold the slice to cover the stuffing. You can also roll the eggplant slice if you wish. Serve immediately. We like them warm in this weather but in summers it would be just right even when served cold. You can arrange all the rollatini in a baking tray, spear some pomodoro sauce over it, grate mozzarella cheese over it and bake it till the cheese melts and serve bubbling hot. That makes a richer version of the classic Italian rollatini. ** To make ricotta cheese for this recipe, mix 3 cups of whole milk with a cup of fresh cream (25%) and bring to a soft boil. Take the pan off the flame and add 2 tbsp of lime juice drop by drop and stir till the milk solids curdle and whey separates. Line a strainer with a cheesecloth and pour the contents into it so the curdled cheese collects in the cheesecloth. Let it drain for 5 minutes, place in a bowl and mix using a fork or whisk so it stays creamy for the recipe. Use the whey to make soups of to knead bread dough. I came across these interesting lines by vikas Khanna while flipping across the pages of World Feast. I have always felt migration can be in the physical sense covering a distance to be somewhere and it can also be a state of mind when you unlearn a few conditioned 'truths', conquer mind blocks and move into a new territory of knowledge, realization and growth. And freedom. You don't have to migrate from one place to be into a new place, travel makes is possible to keep migrating to new places and experiencing the unknown very often to those who choose to be free. I love going to new places, exploring the unseen, witnessing new horizons, meeting new people and learning about new cultures. Sprinkle some love for nature into this and it makes a heady cocktail that makes an experience called travel. I like being a traveler on a whim, with no definite plan to visit the touristy spots and going by instinct. I have traveled on my own and with Arvind a lot and there have been a few times when we travel in groups too especially when we go for treks and cycling expeditions etc but I think we enjoy being on our own most. Although I feel really comfortable even with strangers and I am very accommodating with my co-travelers whenever there have been such times, I feel the need to experience things in our own way is always better. For travel is a very very personal experience, we live through it differently and learn through it very very different. People and places make an impression on all of us, but slightly differently to each one of us. That defines our journey. Harvinder the real (original) ricotta comes from the whey which is treated to separate some more milk solids from it and the resultant cheese is called ricotta which is slightly granular but creamy. This ricotta replicates the textures with normal curdling of milk like we do for paneer but it is different from paneer in its texture and fat content. Note that paneer never has fresh cream added to the milk when starting and paneer is a set cheese, ricotta is crumbly and creamy. Hope it helps. Tried these with red bell peppers & ricotta.. nice, will definitely give it a shot again...When you say 25% fresh cream which store bought cream would u recommend... Amul fresh cream or milky mist fresh cream will do? Most fresh cream available in Indian market is 25% fat, including Amul. Use any cream you like.